So I will confess I was a bit dubious when I received The Christmas Promise: Colouring and Activity Book. It felt a bit thin and I wondered just how engaged my kiddos would be when I asked them to have a go. This instinct was about right for my 9 year old who only gave this book a quick flick through. 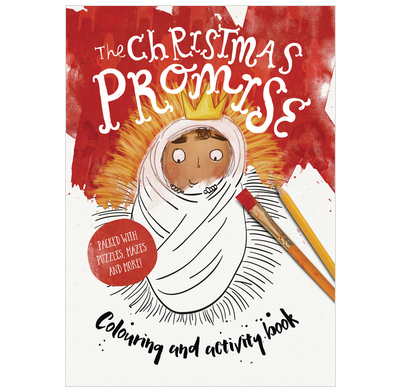 But for my 6 year old The Christmas Promise: Colouring and Activity Book was pure gold. The puzzles and colouring tasks are pitched just right for him. He was captivated by this book, and it transported him into his own little imaginative world. While he coloured I would ask Bible content questions, which he was more than happy to answer because the questions corresponded with the activity he was doing at the time. But to be honest, most of the time he was happy to just engage with this book on his own. When I wasn't looking, he began to evangelise his younger brother (age 2) using the pictures he had drawn as a prompt. Our son worked through the whole book in about 2 sessions, so there is a pretty short shelf-life to this edition. I guess my only request would be that it was a bit longer, but for £3 it’s about what one would expect. All in all, this is a good Saturday morning’s worth of fun and a good way to get the kiddos into the Christmas spirit.